This past weekend, I resolved to make this week one of truly putting God first. There would be no yelling, no getting exasperated when things didn’t go my way, no trash talking on the phone with friends; nay, I would be a model of Christian love and grace to everyone I encountered. 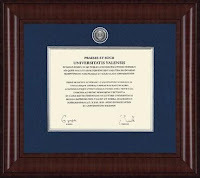 Back when my husband and I were first starting our business, we needed to do everything possible to give clients a good impression so I looked forward to getting his Yale diploma out of the closet and putting it in a prominent place in his office. When I got it out of the box, I was horrified: it was all in Latin! UNIVERSITATIS YALENSIS?? How was anyone even supposed to know what that meant?! I could just imagine myself striking up conversation by saying “So, is Yalensis in Texas?” if I’d seen that on someone else’s wall. I keep telling my husband that I’d be happy to just attach his name to this far superior diploma template. He has yet to take me up on the offer. I finally got my Maya Wrap all set up after unthreading it to wash it, and I’d forgotten how much freedom that gives me! The other day I was able to chase my toddlers around a park while the baby dozed off in the little pouch. It took me a long time to figure out how to use it, but I looooove my sling now. I keep toying with the idea of joining a CSA. I like the idea for a lot of reasons: I’d be supporting local farmers, we’d be forced to eat more veggies than we normally would, and all the food would be fresh (and most of it organic). Yet I have this fear that, instead of my vision of our table overflowing with creative new veggie dishes at each meal, I’d end up with a bunch of rotting vegetables in my kitchen. Does anyone have any experience with this? Is it hard to use all the food you get from the farmers? Does it save money? I’d love to hear any thoughts. You don’t realize how many portrayals of napping there are in cartoons until you’re a very sleep deprived mother of toddlers. It’s like watching those Pizza Hut commercials when you’re on a diet. Really painful. Last weekend was one of the first weekends that I had much success with making Sunday a day of rest. It has been surprisingly hard to get into that habit! It made last Sunday a really pleasant day and started the week on the right note. Hopefully I’ll be able to do it again this weekend! 45. Em. @ Gratitude. Simplicity. Frugality. Jennifer, love your creativity with the framed diploma. Tell your hubby I vote for yours. 🙂 As for the first one, yeah, we’re all works in progress until the end, for sure! Especially when little ones are about, stretching us to our absolute limit. When I say, “God, have mercy on me,” I am TOTALLY serious now. And I say it quite often. Wishing you a restful Sunday! When I graduated, we did get a copy of our diplomas in English. The actual diplomas were much too big to be handed out as we crossed the stage, so we got an 8×11 sheet of office paper that offered the translation from the Latin into English. They were the same for everyone, not personalized by name or anything, but helpful. My university used to issues degree certificates in Latin – and the Latin version was the only “official” bit of paper. The Dutch translations were just that – translations – and were meant so that if you couldn’t read Latin, pat pat pat, here’s the Dutch instead. We joined a CSA for the first time this spring–mainly because I can pick up the delivery at a house in our neighborhood. I hear there’s a lot of chard. I’m hoping to keep a visual blog with photos of each week’s box, for my own reference and as publicity for the group. A Catholic family organizes the CSA (I presume) in exchange for their share of the food. Re: the CSA thing, I’ve done something similar with getting a box of organic vegetables delivered once a week (or every two weeks). They posted the contents of the upcoming box the week before (I don’t know if CSAs work the same way), and – this is the important part – we would distribute the veg throughout our weekly menu plan! When we “remembered” to do this, we ate it all, even the exotica. When we “forgot” we ended up with fridge sludge. I’ve always heard, be careful what you ask for when praying to God. Wednesday morning I asked God to help me find beauty in everything that day. I especially asked for help with bad drivers. Two hours later two teenage girls cut me off and started laughing at me. I did one of those obnoxious waves. ugh. I used to get a fruit and vegetable box and had a mixed experience – sometimes it meant more creative vegetable dishes, and sometimes more rotting vegetables. The successful times came when I was on top of a menu plan; the unsuccessful ones when life got in the way and my menu plan fell apart. I’m in a fairly organised phase at the moment so think I may start getting the veggies again. Funny … Google threw up an ad on the vegetable flute video for the organic veg scheme we use! I have had the same thoughts about all these wonderful vegies gracing our table. What I have found really happens is…a lot of rotting vegies in my refrigerator. As hard as I try, they always end up going to waste. I guess we just don’t eat vegies enough – like around the clock! I would like to encourage your Sundays of rest, too. It is hard to stick to sometimes, but it is really what we should be doing. We sometimes offer up our struggle as an act of reparation. Good Luck and God Bless. I had a local farmed delivered produce service for a couple of months (not technically a CSA, but same effect) and my experience was of the rotting vegetables in kitchen variety. It wound up being a huge source of stress for me to figure out how to use up the vegetables. I also found I always got some vegetables I just didn’t care for (and this was a service that let you substitute) and I missed being able to be impulsive about buying the fabulous looking asparagus in the supermarket because I had all this other stuff I had to use. After two months I did the math and found it didn’t save any money either. It would be helpful if you could find someplace that let you do just a month or two instead of having to commit to a whole year so you can find out how you like having someone else pick out your vegetables for you — because essentially that’s what’s happening. I find I’m far to much of a control freak especially when it comes to food to be comfortable with that. I’m sure others have had a fabulous experience with a csa and like you, I LOVE the idea of the csa, but you really have to think about how you cook and plan meals etc. to decide if it will work for you. I’ve always wished for a true Sabbath too, but have yet to figure out how to make it happen. Ok, I agree, he worked hard for that diploma, PUT IT IN ENGLISH already! 🙂 I like your replacement diploma…he didn’t? LOL! I love my sling, too! However, you’ll hate it when I say my favorite one is the one that I spent $4 on. It is a simple piece of gorgeous blue batik cotton – bought it in Ghana. I tied that baby up in a “rebozo” style (sling goes from shoulder to hip – baby sits in pouch on hip). I also have a storchenwiege, which cost a great deal more (and I do like it a lot), but my simple sling is the best! About the CSA – a very good friend did one here in IL for a year. For her family of 4 it was a little more than they would spend on veggies a year but not by much. She had few rotten veggies, BUT she spent A LOT of time finding new ways to prepare turnips and beets. At the end of that year she decided that she would just go to the farmer’s market. It went both ways for me. I had both rotting veggies in my kitchen, AND creative new veggie dishes. But my issue with it was that I only have two mouths to feed, and very little time to prep vegetables. Even when I was good and ate veggies at every meal (yeah, even breakfast–turn those zucchinis & carrots into muffins! ), I still had leftovers. One thing I wish I'd done more of, that turns out to be incredibly easy: freezing and canning. Canning takes some coordination, but certain veggies can much more easily than others (tomatoes). The rest will pretty much freeze really nicely, except for lettuce. Bottom line: I recommend giving it a try and seeing how you do with it after a few months. Give it time for the enthusiasm of the newness to wear off and then see how it fits into your daily routine. You can always cancel your subscription (or whatever their calling it these days). My experience with the organic veggie co-op was, yes, piles of rotting vegetables. And we were getting a 1/2 order! It was ok at first, but once anyone was not healthy at all (sick toddler, sick husband, sick me…) I could not keep up. What finally drove me to quit, though, was the realization that every week we got either: beets, or sweet potatoes. I don’t like either. I can force them down once, convincing myself they are sooo healthy, but I can’t do it every week. (This was in Dallas – I assume you’d have the same fall/winter veggies as us.) Maybe you are more with it than me, though. I just signed up for a CSA for the first time! So I don’t have any experience, but I’m excited about giving it a try. 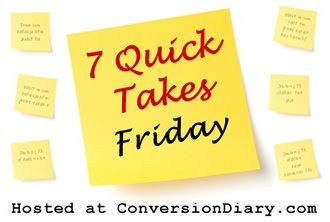 I’m back in the 7 Quick Takes game after going AWOL for over a month. So much fun! We joined a CSA last summer. Since it right now it is just DH, myself and our two year old, I don’t think we’ll do it again. It was a lot of vegetables; we had to throw some out! If I ever do it again, I will can/preserve some of the food OR possibly split the CSA membership with another family. I would think about how your little ones eat vegetables before doing it. The vegetables were delish, though!!! Heres to a day of REST!!! I’m not going to get much this week. I love a good sling too…makes everything easier. I loved my Maya Wrap too! I used it basically every day when my baby was 1-22 months old. The only downside was having to unthread it to wash it and then trying to get it threaded correctly again…it got very icky at times, but that helped to boost my kid’s immune system, I’m sure. Useful tip for the Maya or any ring sling: Use a sewing machine to sew along one edge in a bright color. Then you’ll never be confused about which edge goes on top! 1. Share the share with another family with somewhat different tastes. They’ll eat some of the things we don’t want, and sharing makes it more affordable. 2. Plan to spend some time, on the night the share comes, packing vegetables for the freezer. Most vegs can be cut up, stuffed into bags with the air sucked out, and frozen for cooking in the winter. I freeze everything I don’t anticipate using within the week. Still, there’s some waste when we get busy or sick and don’t make as many homemade meals as anticipated. Do you have a compost heap? Even if you don’t have a garden per se, you can use the compost under your bushes and feel like you’re getting SOMETHING out of the vegs that went mushy and the stems, etc., of the ones you did eat. I’m so glad I found your blog – I truly look forward to reading each day. We love our CSA – if your local one allows it, try to split your membership with another family. It took us a couple of years to really learn how to eat and cook all the yummy goodness, and I hated when things went to waste. Went to the Univ. of Pennsylvania whose diploma’s are also in Latin. One employer requested a transcript so the could ‘verify’ I had attend a nursing school in the US. LOL! I love my sling also! We have a local CSA run by a guy who also sells at the farmers’ market. He has a discount plan, where for a couple bucks less per week, instead of picking up a prepacked selection, I get an empty bin to fill at the farmers’ market. Of course I have to be there early if I want the best selection, but it’s within walking distance. And the best part? $11 per week, for the six month growing season. For all the veggies I can eat, and only the ones I like. It’s a beautiful thing. Just linked to you for the first time! That was fun. We just joined a CSA for the first time — I’m splitting it with my sister-in-law. We’ll see how it goes; I’m looking forward to it immensely. another note re: slings. I found a sling totally confounded me, I just could not get the hang of it and my baby hated it, though eventually would tolerate it for short walks. I finally tried a Mei Tai and it was much easier for me to use and evenly distributed the weight of the baby across both shoulders. Re: Yale: For some reason I know quite a few people who went to Yale and Harvard (I didn’t) and they don’t even mention that they went there in casual conversation. It seems to be like a huge faux pas. They say things like “when I was living in New Haven,” or “I went to a school in Boston.” I don’t know if it’s those particular people or a larger culture but I think it’s interesting. I buy a the local farmer’s market in the summers. What a difference fresh produce makes. Where can I get a Carrot-Panpipe? Am leaving a comment after linking, as per instruction! I cherish all those maxims by Fr Thomas Hopko; they are inexhaustibly fresh, and of universal application. We did a CSA for a couple years. My great thought was that my children would be more tempted to eat new things because they knew the farmer…not so much. Sadly there was a lot of waste. Just going to the farmers market and getting what I know will be eaten seems to be more cost effective for us. As for #1…Indeed and Amen. That would last about as long as it took for me to open my eyes in the morning. The very cranky, stinky old cat is my alarm clock and mornings…not so pleasant. I love my GypsyMama baby wrap. My son’s 20 lbs (at only 7 months), so he’s starting to get kinda heavy to wear for very long, but I love babywearing when I go out instead of trying to carry a carseat around (and bumping my legs, and causing all sorts of awkwardness) or trying to find room in public places for a stroller. Terribly arriviste of Yale to put the certificate in Latin. Oxford doesn’t (although the graduation ceremony itself is all in Latin and you have to be prodded when it’s your turn to go to the front). We have a veg box, although the compromise is that we get it fortnightly rather than weekly. The latter just means an eternity of gently decaying chard leaves and spring greens and all those things that you don’t choose to buy for a reason… It’s good to be challenged though. My thanks for the maxim, btw–much appreciated. Love the Fr. Hpoko quote! Hi – here is a link to the CSA that we belong to. We've signed up for our 3rd year. We also do a fruit CSA and a chicken CSA. It takes time and planning but we rarely have any rotten veggies. Freezing and canning helps. We love soup so many of our veggies end up in the freezer as soup which we enjoy all winter. We are considering a CSA also. Actually I am- My husband is a non-veggie/fruit lover so I’m going to have to convince him it’s worth it for me and the kids since we go through fruits and vegetables like crazy. I’ve thought about the “extra” problem- I’m willing to can or to pass the surplus on to some of my family if I know they will use something. Hi, we did the CSA, and it was really good. I will be up front here and say I was glad to stop it, but I was really glad we gave it a try. We would pick up our box at local pick-up spot. Our box was for 1-2 people, but that meant about 13 fruits/veggies, so it was more than enough for us (2 adults,2 toddlers). The produce was usually picked the same day we got it. This was great. Not so great was that they often had bugs (it was organic)and dirt on them, so when I brought the box home I would spend about 1-2 hours cleaning all the produce. Fill sink with ice cold water, soak, scrub, rinse, dry, chop, and bag. Some of the things like broccoli I just had to throw away because you can’t get the bugs out of the florets. Other foods were great and needed no cleaning like mandarin oranges! I called the college farm were we were getting the produce but it never really got better. I was also 8mo pregnant, so it was really hard on me to stand at the sink for two hours after putting the kids to bed! We stopped getting the boxes after the 10 weeks was up. On the bright side it did make us eat, not only more veggies, but also veggies that we would never have picked out of the store. On Sunday I would receive a news letter telling me what was going to be in the box for that week and I would make a meal plan around this. This made it a lot easier to use all the produce. Check out allrecipes.com if you need ideas for strange veggies 🙂 I never had any veggies go bad because if I could not use them up in a meal I would steam them in the microwave, puree them in the food processor, then freeze them in ice cube trays (each cube is 1oz or 2tbsp). I would put all the cubes in a gallon ziplock in the freezer and then add them to things like soup or anything else I could think to “hide” some veggies in. We did a CSA last year and split both the cost and the veg with my inlaws – mostly b/c my kids aren’t big veggie eaters. They devour the fruit and stare at salad. Splitting it with my inlaws created the perfect amount of food – 2 adults in each household, one big kid here and two little kids here – no kids with them. The food tasted so good and the kids enjoyed picking it up with me. To banana and any others who get broccoli–if you soak the heads in water with either vinegar or salt in it (strong enough that you can really taste it) the little bugs and worms will let go in self-defense and float to the top or sink to the bottom. If you have a particularly buggy head for some reason, break it into big florets with your hands. 15 minutes soaking and a quick swish and they are ready to go! I’ve found that when I observe the Sabbath, my workdays are more restful. Just started a fabulous new book on the topic. Also–we’ve been members of a csa in the past. I enjoyed the variety. Definitely more work. Handling my plethora of fresh veggies inspired my love of making soup. 1. you don’t necessarily need to identify it to eat it. 2.when in doubt, cut it up and sautee it in olive oil! #6: Awww…you poor thing. That is just so mean of cartoonists to do that. #7: how do you do this? I try and try and have decided that even Orthodox Jewish women (who plan ahead, I mean) rarely get to really rest on the Sabbath. I mean, the poo on the bedsheets really needs to be changed even if the laundry can wait, right? After looking through various of the 7 Quick Takes links, I’ve noticed a very definite trend. They’re ALL women. Ok, I did find one single lone guy there, and maybe there’s another one somewhere hiding. And maybe it’s not THAT interesting or surprising that a stay-at-home mom would have mostly women reading her blog and participating in 7QTF, but still. There’s a lot of variety among all those women; married, single, with children and without, all over the country. Why not more guys too? About the CSA: My husband and I get a box of organic produce, every Friday. It isn’t always local (you can’t get grapefruit from Ottawa! ), but the company tries to make it as local as possible. Downside: I do end up wasting some of this precious stuff. It’s a matter of discipline, though. I can check by Tuesday what’s going to be in our organics box, and then I should plan meals around those in-coming foods. So, if you can do that, it’s a wonderful idea. It’s not cheap, however, for us, because we are receiving organic produce. But we love the idea and shall keep it up as long as we can. 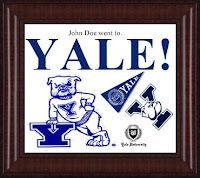 Oh my — I laughed out loud about the Yale diploma! Bwahahaha!